Set a date for your move and contact professional movers for pricing. Gather all packing supplies: boxes, bubble wrap, packing tape, markers and labels. Begin separating your items into those you will keep, donate or discard. Start packing items that you don’t use as frequently. Arrange for child and/or pet care for the day of the move. Get addresses of any new schools your children will attend after the move and have academic reports transferred to the new location. Give forwarding address to Post Office 4-6 weeks before moving day. Change address for any subscription services--they can take a few weeks to forward. 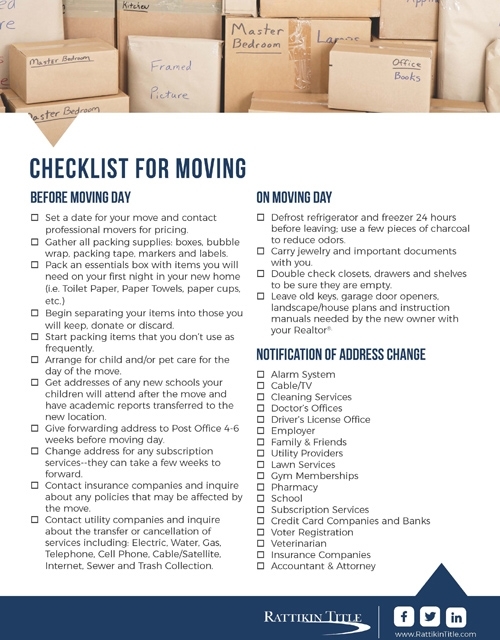 Contact insurance companies and inquire about any policies that may be affected by the move. Contact utility companies and inquire about the transfer or cancellation of services including: Electric, Water, Gas, Telephone, Cell Phone, Cable/Satellite, Internet, Sewer and Trash Collection. Defrost refrigerator and freezer 24 hours before leaving; use a few pieces of charcoal to reduce odors. Carry jewelry and important documents with you. Leave old keys, garage door openers, landscape/house plans and instruction manuals needed by the new owner with your Realtor®.